This darling cottage was a newly-weds dream built by our own Grandy and Grandma with the help of their builder relatives. Now freshly renovated throughout, step into the special charm of its original pine paneling and great-Grandma’s braided rugs. Relax in the ambiance of the woods in front of a crackling evening fire; swim or catch tiny crabs in the seaweed at sandy Light House beach a mile away; or enjoy bustling Boothbay Harbor with its many tourist attractions and water activities within 5 miles. The queen bedroom and bunk bedroom are perfect for a young family of 4 or a romantic get-away for 2. Two small hide-a-beds in the living room allow 2 more to be squeezed in. Pet friendly. This is the third year that we have spent a week in this cottage and we are already looking forward to next year. I can't think of anything that needs improvement. The cottage is roomy, the beds and furniture are comfortable, the kitchen has everything we needed, the washer and dryer are nearly brand new, the store and the beach are only a short drive away and there is a gift basket waiting for you when you arrive. This little cottage is the best! It was so homey and comfortable! We are hoping to come back again! 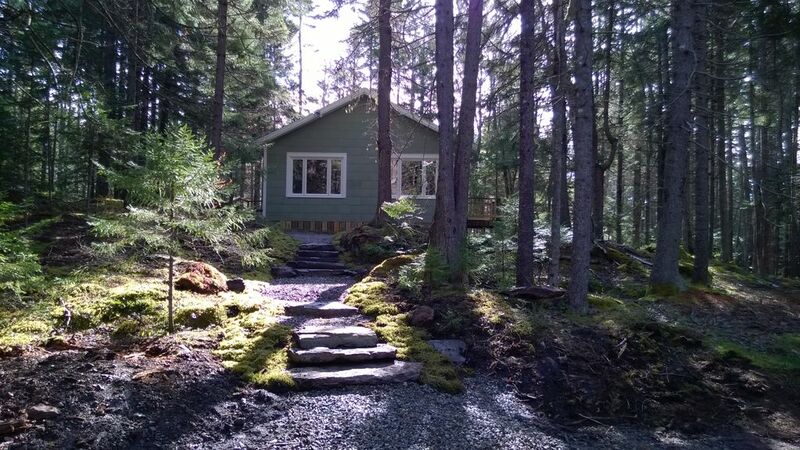 How wonderful it was to arrive to this private cabin with the inside so clean and inviting! Being on Southport opened a whole new world to the Boothbay experience. Finding the wonderful hiking trails throughout the region made it extra special for us and our dog! Looking forward to coming next year, hopefully for a longer stay! The cottage provided me with everything I needed for my Maine holiday. The extended family gathers on Southport every year, and this little cottage allowed me to be nearby to join in family fun, a quiet refuge for rest and relaxation, and a place for “sleepovers with Grammie.” It was equipped with everything I needed; it was cozy; it stayed cool on the hottest days; and it was comfortable. I had a wonderful vacation there. Southport was an excellent location choice for visiting Boothbay Harbor. It was nice to be able to drive such a short distance to the hub of Boothbay activity, but then return qur very private and quiet cabin. This is a very special place -- house, Southport, and region of Maine. We will return. This was our third visit to Gma & Grandy's cottage and it continues to be our favorite vacation spot. It is clean, quiet, with everything we needed for a week long stay. The beach is a short drive away and Boothbay Harbor a slightly longer drive. Check-in time is after 4 pm. Check-out time is by 10 am.